This is the first game in the Monkey Island series. 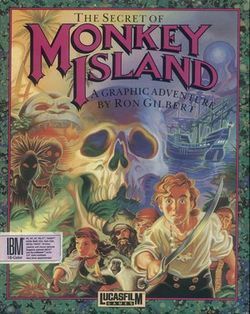 For other games in the series see the Monkey Island category. The Secret of Monkey Island is a graphical point and click adventure game released in 1990 by LucasFilm Games (now LucasArts). Deep in the Caribbean, the inexperienced and naive Guybrush Threepwood sets out on a quest to become a pirate, encountering romance, adventure, comedy, pirate ghosts and, um... monkeys. Based on the SCUMM game engine and originally released for Windows, Atari ST and Commodore Amiga in 16-colour EGA, it's been updated over the years with improved graphics and sound. Arguably the most famous version is the 256 Color VGA for MS-DOS released in 1991. In 1992, LucasArts released a CD-ROM version of the title with CD Audio music to accompany the gameplay. The game is now playable on Windows with ScummVM which improves the graphics even further. A remastered version of the game, featuring new high-definition graphics, a new user interface, full voice acting and an orchestral score, was released for PC and Xbox Live Arcade on July 15, 2009. It is famous for its humour, characters and plot. It is a great starting point for new adventurers, as the control interface is extremely user-friendly, the puzzles are not too challenging and it is impossible to die (almost) or lock yourself out of being able to complete the game. To date, three sequels have been created. This page was last edited on 16 August 2016, at 17:50.